Camp Nashoba™ is a Massachusetts children's camp located northeast of Boston offering traditional summer camp experiences for boys and girls ages 4 to 15. 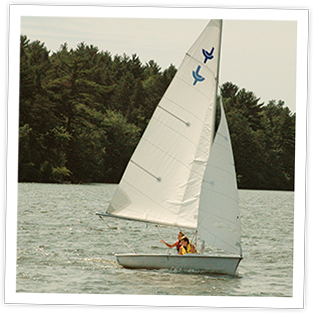 Nashoba is often described as a day camp with a wide variety of land and water activities with the feel of a New England overnight camp. Instruction is offered by a talented and mature staff in water sports, horseback riding, fishing, nature, target sports, woodworking, tennis, sports, Red Cross swimming, waterskiing, windsurfing, wakeboarding and much more. Founded in 1957, Camp Nashoba™ is a family operated, traditional summer camp for boys and girls, located in Littleton, Massachusetts on the northeastern shore of scenic Fort Pond. Sessions range from 2, 3, 4 and 8 weeks for new and former campers. "Julia had a great 4 weeks and learned lots of new things and made new friends. She loved getting up on waterskis, boating and all of the different arts and crafts." "Thank you everyone at Camp Nashoba. Both my girls had an amazing summer. They want to come to camp every year and work as counselors when they are grown. Your staff is warm and mature and really engaged with the kids. They add such an excellent layer to the fun — they inspire the girls and are very nice role models. I have seen such growth in both girls in just 8 weeks! They loved every minute and I am as thrilled as a Camp Nashoba parent as I was when I was a camper! Thanks so much." "Our nine year old son has been attending camps since he was four and has had a variety of experiences. I must say, without a doubt, his experience at Nashoba has been the best — specifically, the quality of the activities, the enthusiasm of the staff and the wonderful environment. I appreciate the "attitude" of the counselors — they respect and appreciate the child's opinion and perspective. As an alumna of Camp Nashoba, I am please to see my son enjoy it as much as I did. We look forward to next summer! Many thanks." Our 2018 summer camp sessions. Take a tour of our campus! Tours are available throughout the fall and winter. Meet with the Directors for a private tour at your convenience. 978-486-8088. Bring a new friend to camp this summer and you will both receive a tuition discount!